Ha! Bet you thought I was singing, "It Is No Secret What God Can Do", didn't you? Nope. Actually, I don't know that one after the first line. It is no secret what you do online. Well, for most people. I had a guy arguing with me on Twitter last night about an article I wrote. (Do you know how annoying it is to try to have a serious discussion on Twitter?) I have a service that tells me the basics of visits I get. I made the comment about the town he's in, and that he's using Firefox (my regular readers know that I like Firefox). He got nervous, or pretended to get nervous (I think this guy was setting me up, but I will not go into that). Then I discussed it with Hal the Hacker. Yeah, I know, my writing is a bit disjointed. Waiting for the second cup of coffee to kick in. Sorry. See, you don't need a site visit tracker. The point is that your information is available wherever you go. You are "giving" it every time you visit a site. Whether they monitor that information or not is another matter. Want something even more alarming? (No, I'm not going to send you to something that will hurt you. What do you think I am?) Click here, then "view more details"; quite a bit about your browser and system is easily available. Wish I could find the one that told me what software was installed on my system, that was alarming, too! "Why are you shooting off your mouth this morning, Cowboy Bob?" Because shooting my guns at this hour wakes the neighbors, shooting off my mouth is actually quieter. I do want people to know that there is nothing to be alarmed about. Your information is readily available, and you've been spreading it all over the planet when you're using the Web. Some people say, "Don't use Google, they store everything you do." Yeah, big deal. So do the others. But think of this, that there is a great deal of information to sort through. It might be useful for legal actions, but not to the average user, capice? If you're worried about identity theft or want to protect your online privacy (maybe you're doing undercover work for The Circus), you can check here, here, here, and do a general search on something like "protect my identity online" or similar. The location information comes from databases saying IP address range 1.2.3.4-1.2.255.255 are given to ISP XYZ, Inc. And they are in Sacramento, or even just collected data saying Comcast has all these IP ranges, and this certain one is in a range known to be given out in Boise. They're not always accurate either, for a long time the IP address I had showed up for a town a couple hundred miles away. Another site for IP lookups is http://ipchicken.com/ which is just funny but easy to remember. Doing support for ***** smart phones, we'd have the users go there to give us their IP range. I was also thinking... "there's so much noise on the internet, unless you're doing something that screams look at me! !, you'll never be noticed because no one really cares." 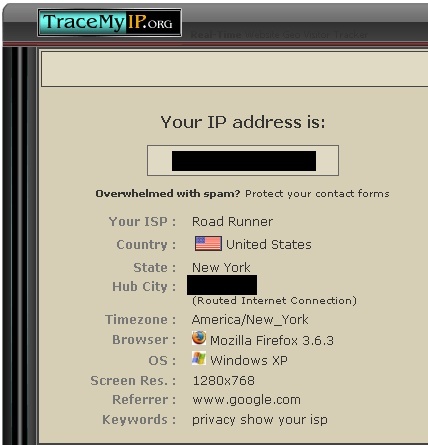 By the way, sometimes you need a quick reference to your IP address, so having it reflected back to you can be a plus. Sites like this are performing a service. Also, it has useful information to ease your mind. So... it's happening, it's been happening and I don't think it's that big a deal. But I must add that if you're transmitting financial information, use trustworthy connections (not the computer at the library, f'rinstance). I'm not going into that, so if you need that information, click here and here. If you'll excuse me, I have a weekend to fulfill. Oh, shoot. It's raining. Book time! I made this in response to attacks on religion (especially on Christianity) by militant atheist trolls. They do the lame thing of "religion is the cause of wars", etc. Oh, really, Skippy? If you did your homework instead of filling your mind with hate, you'd see that atheists are the greatest mass murderers in history! 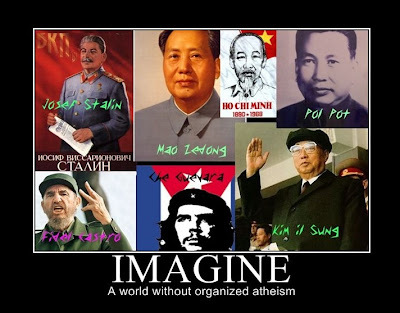 Institutionalized atheism incorporated into communism is a vicious lie, a political and moral failure every time. I did not have time and the room to put all of the atheist leaders in the picture. Amazing how "progressives" revere these losers. Click for full-size. Need I continue? Didn't think so. Addendum: For those who do not want the actual content of the site, but want to see whiny boy's comments, this article has some really great comments by another obstreperous, recalcitrant atheist. Comments on this Weblog have been disabled. Buona sera. I swiped this image from Dan's site, "Debunking Atheists". I find some good images on my own now and then, but I really like that one. OK, enough of this jocularity. Uncle Bob is not feeling too playful today. Where do you get your morality? More than that, where do you get your integrity? Yeah, bet you didn't see that one coming. I've touched on the topic before, but it's been coming up lately, so I wanted to go into some detail. We have many sources. One atheist said that "morals are reasoned and mutually agreed up on in a society... believe we can see an evolutionary mandate for social cooperation and moral codes". (Sorry, Dude, I think that's horse pucky.) Other atheists have said that they have "morals", but just try to pin them down on a final source, and they can't do it. They prove that they are intelligent, moral creatures by badgering, lying about and misrepresenting Christians, trolling, lack of logic and all kinds of cowardly foolishness. Sure, they hate God and the Bible, but have no ultimate source for their morality. And they have proven time and again that they have no integrity. When I confronted trolls, they said it was because "I deserved it". HUH??? Some morality, there! It came from the opinion of the moment. 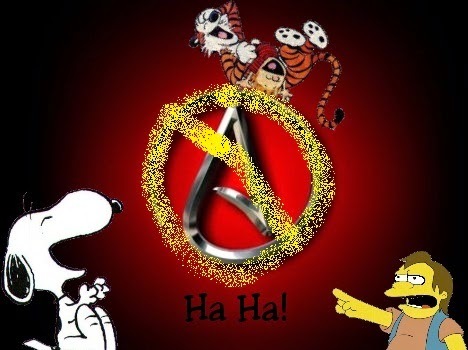 Nicky said, "Atheists [on that Weblog] are subjective. You have cookie cutters and expect Christians all to look the same. And act the same. No emotions allowed even though you **** in their faces... saying that Stormbringer got flamed because he deserved it. Standard Internet protocol says to ignore whatever you think deserved it and to act like rational human beings. Atheists aren't doing that." Boy, do they get cranky when someone tells them the truth! So, they flamed Nicky as well. Fine. They all combine to make us what we are to varying degrees. But they change. You say you like the band Day of Fire just to win my approval, then convince yourself that you like them. Or the old clergyman said that rock music itself is evil, so you give it up. The trend in society is to vote a certain way or to hold certain values. It's "in" or "cool" to be a bandwagon atheist. Your mother told you never to date anyone that isn't Italian (smart, but still arbitrary). You choose to hate Belgians because that's just what your family does. Later on, you make changes. You decide to listen to rock music again, what did that old clergyman know, anyway? Then you exchange your interest in Day of Fire (but you can still get it for my birthday) for August Burns Red (sorry, I can't do metalcore). Further, you realize that you were calling yourself an atheist just because your friends were, and you're having second thoughts. You're dating a Jew instead of an Italian, and apologize to your mother. Then you realize that Belgians aren't that bad, but you can't stand Chileans. All of that stuff is not nailed down. Where is your morality? Do you have a source that is not changing, that is trustworthy? Then you have your integrity. That is more than just opinion, it's who you are. Your integrity is your unchanging values, your morality that is not compromised. Let's face it, if your integrity is based on compromise, it's not worth much and you're not trustworthy. My source is the Bible, and I'm trying to live so that I please God. Isaiah 40.8 Yes, I often fail, but I do have an unchanging standard. Galatians 1.10 There is someone to encourage and comfort me, and to rebuke me when I fail.